Submitted by Santa Clara Vanguard: March 6, 2007 marks the 40th anniversary of the formation of the Santa Clara Vanguard. It was following a meeting of the Sparks Parents Association where the disbanding of the drum and bugle corps was voted on. 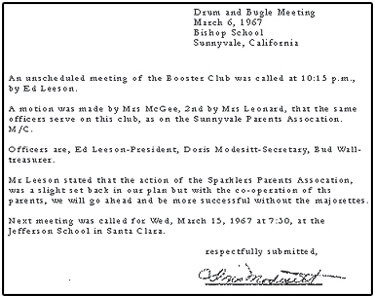 Santa Clara Vanguard founder Gail Royer and several parents who were there to support the drum and bugle corps activity of the Sparks, walked out of the meeting and asked the waiting members if they wanted to have their own corps. With a resounding yes by the members, those parents opened their own meeting and agreed to form a new organization. The following Wednesday evening, which was the next scheduled rehearsal; the members met and were given the chance to name their corps. The rest is history. Every year since, a birthday celebration has been held by the corps started as a pot luck dinner. Today, the corps celebrates every March with a spaghetti dinner which also marks the first public performance by the corps. This year the dinner is being held on March 25. The Vanguard, Vanguard Cadets and the alumni corps will perform at the dinner. Learn more about the Vanguard annual birthday dinner on www.scvanguard.org. Santa Clara Vanguard corps hall.